Grant, O Lord, that in the spirit of the Apostle Paul we may pursue the surpassing knowledge of Jesus Christ, for, having learned it, Saint Anthony Zaccaria constantly preached your saving word in the Church. Through our Lord Jesus Christ, your Son, who lives and reigns with you in the unity of the Holy Spirit, one God, for ever and ever. O God, author of peace and lover of charity, who adorned Saint Elizabeth of Portugal with a marvelous grace for reconciling those in conflict, grant, through her intercession, that we may become peacemakers, and so be called children of God. Through our Lord Jesus Christ, your Son, who lives and reigns with you in the unity of the Holy Spirit, one God, for ever and ever. 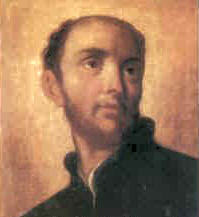 St. Anthony Mary Zaccaria was the founder of the Clerks Regular of St. Paul, later called the Barnabites from the name of their principal church in Rome. He also founded a congregation of nuns which now no longer exists. He was a great admirer of St. Paul and was himself imbued with the teaching of the great Apostle, whom he gave to his followers as a model and a patron. He was a zealous and untiring preacher and completely wore himself out at this work; he died at the age of thirty-six on July 5, 1539. St. Elizabeth of Portugal was the daughter of Peter III of Aragon and was named after her great-aunt, St. Elizabeth of Hungary, whose virtues she also inherited. In her married life with King Denis of Portugal she had to undergo a series of heavy trials which she endured with heroism. On more than one occasion she went to considerable pains to bring about peace between her children and their father. After her husband's death she became a Franciscan Tertiary and showed unfailing charity towards the poor. She died in 1336; her body has remained incorrupt. Before the reform of the General Roman Calendar St. Elizabeth's feast was celebrated on July 8. Anthony Mary Zaccaria was born of a noble family at Cremona in Lombardy, and even in childhood gave signs of his future sanctity. Very early he was distinguished for his virtues, piety towards God, devotion to the Blessed Virgin, and especially mercy towards the poor, who he more than once gave his own rich clothing for their relief. He studied the humanities at home, and then went to Pavia for philosophy and Padua for medicine, and easily surpassed his contemporaries both in purity of life and in mental ability. After gaining his degree in medicine, he returned home, where he understood that God had called him to the healing rather of souls than of bodies. He immediately gave himself to sacred studies. Meanwhile he never ceased to visit the sick, instruct children in Christian doctrine, and exhort the young to piety and the elders to reformation of their lives. While saying his first Mass after his ordination, he is said to have been seen by the amazed congregation in a blaze of heavenly light and surrounded by angels. He then made it his chief care to labor for the salvation of souls and the reformation of manners. He received strangers, the poor and afflicted, with paternal charity, and consoled them with holy words and material assistance, so that his house was known as the refuge of the afflicted and he himself was called by his fellow-citizens an angel and the father of his country. Thinking that he would be able to do more for the Christian religion if he had fellow laborers in the Lord's vineyard, he communicated his thoughts to two noble and saintly men, Bartholomew Ferrari and James Morigia, and together with them founded at Milan a society of Clerks Regular, which from his great love for the apostle of the Gentiles, he called after St Paul. It was approved by Clement VII, confirmed by Paul III, and soon spread through many lands. He was also the founder and father of the Angelic Sisters. But he thought so humbly of himself that he would never be Superior of his own Order. So great was his patience that he endured with steadfastness the most terrible opposition to his religious. Such was his charity that he never ceased to exhort religious men to love God and priests to live after the manner of the apostles, and he organized many confraternities of married men. He often carried the cross through the streets and public squares, together with his religious, and by his fervent prayers and exhortations brought wicked men back to the way of salvation. It is noteworthy that out of love for Jesus crucified he would have the mystery of the cross brought to the mind of all by the ringing of a bell on Friday afternoons about vesper time. The holy name of Christ was ever on his lips, and in his writings, and as a true disciple of St Paul, he ever bore the mortification of Christ in his body. He had a singular devotion to the Holy Eucharist, restored the custom of frequent communions, and is said to have introduced that of the public adoration of Forty Hours. Such was his love of purity that it seemed to restore life even to his lifeless body. He was also enriched with the heavenly gifts of ecstasy, tears, knowledge of future things, and the secrets of hearts and power over the enemy of mankind. At length, after many labors, he fell grievously sick at Guastalla, whither he had been summoned as arbitrator in the cause of peace. He was taken to Cremona, and died there amid the tears of his religious and in the embrace of his pious mother, whose approaching death he foretold. At the hour of his death he was consoled by a vision of the apostles, and prophesied the future growth of his Society. The people began immediately to show their devotion to this saint on account of his great holiness and of his numerous miracles. The cult was approved by Leo XIII, who solemnly canonized him on Ascension Day, 1897. St. Anthony had great devotion to Our Lord crucified. He institued the practice of tolling the church bells at 3 p.m. every Friday in remembrance of Christ's death on the cross. You could gather the family together at 3 p.m. to say the Prayer Before a Crucifix and ask St. Anthony to increase your love for our suffering Lord. St. Anthony promoted devotion to the Eucharistic Christ in the form of the Forty Hours devotion, public and solemn adoration of the Blessed Sacrament. Find a church that has adoration and make a visit today. St. Anthony was a doctor of medicine as well as a priest, today would be a good time to offer a special prayer for the sick. Learn more about and read some of St. Anthony's Letters. Learn more about the Barnabites founded by St. Anthony. Try cooking Vegetable Soup with Rice today in honor of St. Anthony. Read CONTEMPLATION in St. Anthony Mary Zaccaria’s Spirituality. Elizabeth of Portugal was married young: she was only twelve years old when she became the wife of King Denis of Portugal. She was the daughter of King Peter III of Aragon and at her baptism in 1271 received the name of her great-aunt, St. Elizabeth of Hungary. Even at that early age, she had a well-disciplined character and, like her namesake, looked after the poor and pilgrims, with the consent of her husband. She inaugurated what today we would call social works in her kingdom, set up hostels for pilgrims and travelers, provided for the poor, established dowries for poor girls, founded a hospital and a house for penitent women at Torres Novas, and built an orphanage. Her husband was notoriously unfaithful to her, but she bore all this with patience and her sweetness of disposition was her greatest asset. She even looked after his illegitimate children as if they were her own and made provision for their proper education. She had two children of her own, Alfonso and Constance, the son later rebelling against his father. St. Elizabeth of Portugal became the peacemaker and several times reconciled the son to the father. Through her efforts, war was averted between Castile and Aragon. In 1324, her husband became ill and she devoted all of her attention to him, never leaving his room except to go to church. His illness was long and tedious, but he sincerely repented of his disordered life and died at Santarem in 1325. After his burial, she made a pilgrimage to Compostela and decided to enter the Poor Clare convent at Coimbra. Persuaded not to do this, she became a Franciscan tertiary and lived in a house close to the convent. Elizabeth died at Estremoz at the age of sixty-six, en route there to bring about peace between her son and her nephew, Alfonso XI, of Castile. She was canonized by Urban VIII in 1625. Patron: Against jealousy; brides; charitable societies; charitable workers; charities; Coimbra, Portugal; difficult marriages; falsely accused people; invoked in time of war; peace; queens; tertiaries; victims of adultery; victims of jealousy; victims of unfaithfulness; widows. Symbols: Franciscan nun with a rose in her hand; Franciscan nun with a beggar nearby; Franciscan nun with a jug in her hand; Franciscan tertiary nun; woman carrying roses in her lap in winter; woman crowned with roses. Our own circle of personal influence is usually where we can do the most good. It is useless to dream of going to faraway places to accomplish great deeds, when there is much to be done in our own backyard. We can influence those around us and, like St. Elizabeth of Portugal, we can accomplish wonders.